The Pirates took Luplow in the third round of the 2014 draft by the Pittsburgh Pirates, the second corner outfielder they took early. He’s a solid contact hitter who had the potential to hit for some power in the pros. Luplow showed great improvement in his junior year, hitting for more power and cutting down his strikeouts. At times during his high school and college career, he has missed significant time due to injuries to both shoulders and one knee. Luplow probably profiles best as a right fielder. He’s an above average runner and has had good defensive metrics. He also has an above-average arm. He signed not long after the draft for a reported $500,000, which was $24,300 below the slot amount. Luplow started in the outfield corners for Jamestown, mostly in left. He had an amazing number of outfield assists, 17 in 58 games, including eight in just a dozen games in right. He had a solid season at the plate, hitting for average and power, and getting on base, without being outstanding in any area. Luplow hit about the same throughout the season and didn’t have a meaningful platoon split. 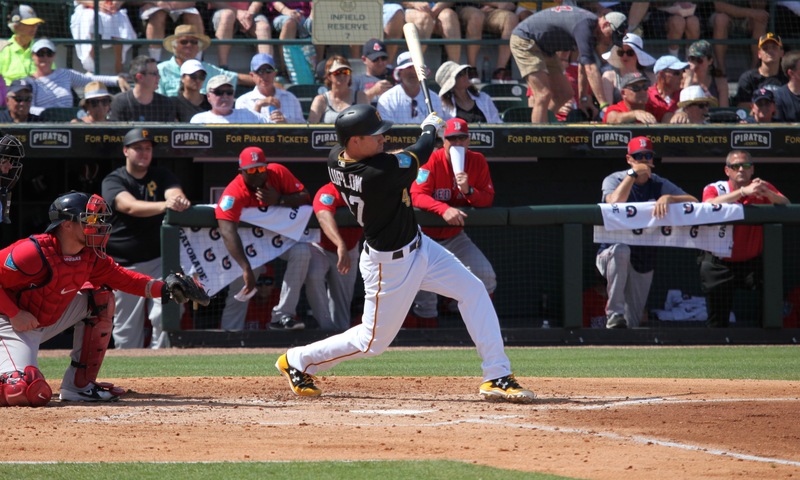 The Pirates launched a third base experiment during spring training, trying various players, mostly outfielders, at the position. Luplow never played there in college, but he emerged from the experiment as the starting third baseman for West Virginia. He missed the start of the season, though, due to a sore shoulder and made his debut on April 16. He had an interesting season. From April through June, he didn’t exactly struggle, but he didn’t hit the ball with much authority. In July, though, he started hammering the ball and hit 307/420/574 the rest of the way. His plate discipline, which was good the first three months, was outstanding the last two, as he drew 31 walks while striking out 24 times. He even did a good job of stealing bases. He had a big platoon split, with an OPS of .960 against LHPs and .768 against RHPs. Defensively, it wouldn’t have been a surprise to see Luplow put up disturbing numbers, but he managed a .910 fielding percentage, which is bad but not nightmarish at that level, and showed no worse than decent range. Luplow missed the last week and a half of the season with an unknown injury. The Pirates moved Luplow back to left field at Bradenton, with Connor Joe getting most of the playing time at third. Luplow played only in left, which makes his year at third in 2015 seem like a waste, especially since Joe arguably struggled there even more than Luplow did. Like nearly everybody on the Marauders, Luplow got off to a bad start at the plate. He had a .579 OPS in April, then .711 in May. He was over .800 every month after that. His plate discipline improved significantly, as he had 42 walks and only 40 strikeouts after May. He had a reverse platoon split, posting an .817 OPS against RHPs and .714 against LHPs. Luplow had a breakout season, easily topping his previous high in HRs in just half a season at Altoona. He also continued to show very good plate discipline. The Pirates moved him up to Indianapolis at the end of June and he didn’t miss a beat, although his K rate increased a bit. Luplow had a fairly sizeable platoon split in the minors, with a .957 OPS against LHPs and .837 against RHPs. The Pirates called him up at the end of July and he went 0-for-9. Clint Hurdle quickly lost interest in him and he was sent back down. He came back up for good at the end of August. In keeping with his fascination with veterans, Hurdle intially left Luplow on the bench while playing John Jaso. Eventually, Luplow started getting more time, although he lost some time when Gregory Polanco came back in mid-September from his latest hamstring injury. Luplow hit a respectable 239/307/448 in September, in 21 games, 18 of them starts. He didn’t play especially well in the outfield, but the sample size was very small. After the Pirates acquired Corey Dickerson, Luplow probably didn’t have much chance of winning a job in the majors, but he had a poor spring anyway and got sent to Indianapolis. He got off to a miserable start, posting just a .511 OPS in April, but got red hot in May and June. He spent about seven weeks with the Pirates in July and August, playing only sparingly, then came back up when Indianapolis’ season ended in early September. In the majors, Luplow hit about the same as in 2017, although with better plate discipline. He showed a little power, but overall just didn’t hit the ball well. He played well defensively, even starting a game in center. Everything about Luplow’s performance in the upper minors, including his good plate discipline, suggests that he should be at least a solid fourth outfielder in the majors, if not more. His defense and speed should help, too. So far, though, he hasn’t shown enough at the plate. With Gregory Polanco out at least for the first month of 2019, the Pirates will need a right fielder. They also need a fourth outfielder in any event, although they’ve increasingly hurt themselves in recent years by using infielders as fourth outfielders. It’s not clear how much of a chance the team will give Luplow to fill one of these roles. June 6, 2014: Drafted by the Pittsburgh Pirates in the 3rd round, 100th overall pick; signed on June 16. July 28, 2017: Contract purchased by the Pittsburgh Pirates.